Resurrect is an action, thriller with a bit of science fiction. I did enjoy this book and would highly recommend it, I would say though, I think this book is geared more to a male reader, and an adult at that. I was sad to say there was a bit adult content that precluded my oldest from reading it, nothing inappropriate for an adult, just not for an eleven year old. I loved the military aspect of this story, as the main character was a former Navy fighter pilot and one who is involved in many Black Ops. This story is about Josh, former Navy pilot who is in a “fatal” accident, but somehow is rebuilt into a new body, but same mind. He then is tasked to save the world from a comet set to hit the Earth in 2 years. While this is a fiction story, there is a tremendous amount of information about comets and meteors, and black operations – not all related. I learned tons of information about these topics and was thoroughly fascinated. I really enjoyed the characters in this story, except for Josh’s temporary roommate (the reason my son cannot read the book, he is a player) and really was not sure why this very brief story line was included. Oh well, it did not stop me from enjoying the book at all, just kept me from passing it down. I really enjoyed the development of Elizabeth, Josh’s friend and love interest. There were many things about the book I enjoyed, but honestly you will just have to take my word for it and read it, if you like action, thriller stories with a touch of science fiction. I do recommend this book, and if you are not a reader of such stories it would be a great book to pass along to the man in your life who may like it! <img src="http://lh3.ggpht.com/-yXeeuIn-Yrc/UJ2w074SjHI/AAAAAAAAHGk/w05LBLHoudk/video016b31472fa3%25255B17%25255D.jpg?imgmax=800" style="border-style: none" galleryimg="no" onload="var downlevelDiv = document.getElementById('9eabc999-3b90-493d-8711-aa5d042ccfcc'); downlevelDiv.innerHTML = "
To read what others are writing about Resurrect check out this LINK. 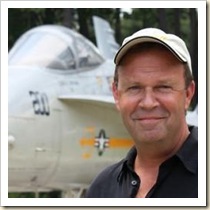 A Navy fighter pilot with hundreds of aircraft carrier landings, Commander David E Stevens holds degrees from Cornell and the University of Michigan with graduate work in astrophysics. He test piloted new fighters and received an aviation patent. With a Top Secret clearance, Dave served as Strike Operations Officer for the Persian Gulf during Desert Storm and led classified defense programs. He’s traveled to over two dozen countries. 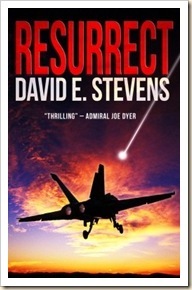 Find out more about David E. at http://www.resurrecttrilogy.com/. Preventing his burning fighter from crashing into a neighborhood, Navy Commander Josh Logan ejects … too late. Critically injured, he’s offered a new life and mission exploit highly classified military technology to stop a global cataclysm. The price? He’ll be dead to everyone he knows. He wakes in a city hospital with a genetically enhanced body and no identity. With the help of his brilliant, Neuro ICU nurse, and guided by nothing but a voice, he must infiltrate the military-industrial complex to develop the world’s most powerful weapon … to protect humanity? NOTE : I was offered a copy of Resurrect at no cost, in exchange for an honest review, by LitFuse.